Average prices jumped in October with the average residential property selling for $449,613, up 7.9% and the average condo jumped 7.6% to $282,781. On a year to date basis, residential average selling prices are up 5.2% and condos up just 2.3%. Residential unit sales continue to flat line, presumably due to inventory shortages. During October 2018 residual unit sales were down vs 2017 by 2.5%. Condos meanwhile, showed an 11.9% unit sales increase during the month. On a year to date basis, residential unit sales are basically flat vs 2017 with a .3% increase. Condo unit sales have been stronger and posted a15.1% unit sales increase. One has to go back to October 2009 to find a lower month end listing inventory than we are currently experiencing in 2018. Current residential listing inventory is 16.8% lower than last year, 33.4% lower than 2016 and 40% lower than 2015. Condo listings are currently 28.2% lower than last year. New listings in October were slightly lower than a year ago with new residential listings down 2.2% and new condo listings down 9.4%, so there appears to be no end in sight to the tight listing inventory situation. Current reports suggest at least two .25% central bank rate hikes in the next 90-120 days which may spur some buyers to firm up deals in the short term. All buyers (especially those buying new construction for future delivery) will want to stay in close touch with their mortgage broker or bank to understand how rate hikes may affect their pending mortgages, as some experts are predicting as many as 4 rate hikes in the next 12 months. Give us a call in you would like to discuss your plans! 613-435-4692 We can drill down on your local neighbourhood market and give you an up to date look at market values. Ottawa real estate results for November continued the trend all year: shortage of listing inventory, sales and price growth and homes are selling more quickly. November unit sales growth was strong (+24.9%) and believed to be a late season surge by those buyers who would be affected by new mortgage qualification rules that will be in effect January 1st. November average prices were up 3.2% vs those sold in 2016. Residential unit sales are up 7.5% year to date this year vs 2016 and condo unit sales are up 22%. The number of new listings continued to moderate and year to date we have -8.9% fewer properties listed this year than last. Listing inventory continues to a major issue for buyers and our numbers show that residential listing inventory is 24.4% lower than November last year and condos are 24.6% fewer. Best price growth this decade! The average price of residential properties that have sold this year has increased by 7% to $424,548 and the average condo selling price is up 3.7% on a year to date basis. Not surprisingly, the time required for the average property to sell is down this year, as buyers move quickly on properties of interest. The average residential property has taken 45 days on average to sell and the average condo 67 days. We see no reason to expect the above trends will change and we should expect another solid year for Ottawa real estate in 2018. We would be happy to assist those with buying or selling plans! The Ottawa Real Estate Board (OREB) released June results last week and reported another stellar month of sales and price gains. Virtually every indicator is positive and suggests signs for continued growth in the months to come. Our best average price increases in many years with the average residential selling price up 7.2% to $427,721 and the average condo up 6% to $274,974 through the first half of 2017. Residential unit sales are up by 10.8% and condos by 26.2%. The one somewhat challenging statistic is the continuing decline in new listings (-10.3% year to date) and the overall listing inventory at the end of June which shows the number of residential listings down 27% from a year ago and the condos down 22.2%. This is a good situation for those selling but not so much for buyers. The Ottawa Home Builders Association reported that housing starts are up 44% this year to date, compared to last-so builders are seeing very strong activity also. Accordingly, builder prices have bumped up this year and buyer incentives have generally decreased from a year or two ago. Conditional sales that do not firm up normally run about 5 or 6% but we notice that this is up to more like 8 or 10% this year. This may be caused by buyers who make an offer quickly and then have some buyer remorse. Another possibility may be sellers are less inclined to adjust prices after home inspections discover some latent issues, thus causing buyers to walk on signed conditional agreements. Tighter mortgage qualifications may also be a factor. We are seeing many more offer dates or “no offers before”, as listing agents try to ensure as many buyers as possible get exposure to the property to optimize value for their sellers. Ottawa has always been more of an “early-bird-gets-the-worm” type of market but listing scarcity and stronger demand are forcing more agents and sellers to hold back offers. Though multiple offers have increased, it is still not the norm (perhaps 5-10% or fewer), so sellers should not be concerned if they do not receive multiple offers. Listings (or lack thereof!) continue to be the dominant story in Ottawa real estate based on 3rd quarter results through the end of September. Almost 3,000 fewer listings than at the same point only 2 years ago! New listings in September are down 10.5% for residential properties and 20.3% for condos vs last year and 22.6% and 26.8% vs 2015. Total listing inventory at month end is down this year 20.1% for residential listings and 24.1% for condos. Compared to 2015, listing inventory is down 35% for residential and 33.6% for condos. Combined this means the current market has a 2,922 fewer properties available for sale at the end of September than the same point in 2015. With total sales demand up 12.1% vs 2015 for residential and 24.6% for condos, it is easy to see how we are seeing average prices rise and more multiple offers. Unit sales were actually down 1.8% in September but average selling price was up 8.2% to $416,464. On a year to date basis, residential unit sales are up 6.6% and the average selling price is up 7.2% to $425,139. 2017 has been one of the best condo markets in many years with unit sales thus far up 23.5% and the average selling price up 4.6% at $272,220. Sellers benefit in this market but of course, those who are also buying face a challenge on that end. One of the basic facts of real estate is that those who own a home are stuck both buying and selling in the same market conditions, so while one may gain on one side, they suffer on the other. Buyers face more multiple offers, a very fast moving market on new listings and limited decision making time. Bottom line: should be a good fall and winter! Though mortgage rates are creeping up with the Bank of Canada recent rate changes and there are continuing steps to tighten mortgage qualifications, our market appears pretty solid and poised for more growth. Investors are still trying to figure out how new rental rules from the provincial government may affect them, so we could see some slackening in demand from this sector as a result. As long as the federal government does radically alter their headcount and spending plans going in to the latter half of their mandate, our local economy should continue to be fairly buoyant and allow us to continue with the positive real estate trend lines which have been strengthening for the last 18 months. This could be the best fall and winter in the last decade to be listing a property, given all the foregoing, so sellers should be reasonably confident they can find a buyer even in our historically seasonal hibernation between mid-November and mid-February. Buyers should keep a close eye on the market as there may be some off season listing gems hit the market from sellers who have been awaiting a new build completion and have to list in the off season to accommodate their move in plans. Ottawa real estate had record unit sales in May and the combination of all indicators suggests we are either in a seller’s market or very much on the verge of one. Sales and prices were up and new listings and overall listing inventory were down thus making for a good month for sellers and listing agents but not so much fun for buyers. May is typically our busiest sales month (followed by June and then April) as our market is boosted by families looking to move before school starts in September and also a strong transition of government staff (primarily military and RCMP) moving to and from our area. The number of residential units sold in May was 1856 vs 1612 a year ago. On a year to date basis through May, residential sales are up 12.4% and condo sales up 27.1%. The average price of a residential property sold in May was $436,625 and increase of 7.4%. The average condo sold for $270,993 in May an increase of 2.3%. Year to date increases for residential properties sold is trending up 6.7% and for condos 4.9%. This is our best average price growth in 5 or 6 years. Listing inventory continues to be the key indicator to watch! New listings continued to slow with condo listings lower than May 2016 by 6.3% and the # of new condo listings down by 13.2%. Overall, the number of new listings is 10% lower this year to date. End May listing inventory signals more scarcity in coming months! The combination of strong unit sales increases and a lower number of new listings leaves us at the end of May with 25.3% fewer available listings in the residential market and 22% fewer condos that in 2016. This means more competition for available listings in general and thus favours sellers. On an area by area basis this may vary but it does jibe with what we are seeing daily in the market. Condo unit sales for May (444) vs new listings (734) yield a ratio of 60.4%, also just in to seller’s market territory. On a year to date basis the condo ratio is 46.8% which suggests a more balanced market. We are certainly seeing more multiple offers and offers days being established by sellers and their listing agents, especially in key geographic areas and price points. Sellers should discuss their pricing and marketing strategy with their listing salesperson to determine the best course of action for their circumstances. Buyers want to be on top of new listings (and price changes) and not wait for an Open House to go and see a property that may interest them. Both sellers and buyers will also want to determine their own position on how they wish to participate in a multiple offer situation, should one materialize. Why pay 5% commission to sell in a “hot” market? Buyers and sellers need their salesperson or brokers’ advice just as much in a hot market as in a slower one….but do you really need to pay 5% commission on the selling side? *not intended to solicit those with existing listings. Savings based on our range of listing commissions vs typical 5%. November 2016 yielded another pretty good month in Ottawa real estate, buoyed by continued growth in Federal government headcount and spending. Sales were positive, with new home sales and condo’s leading the way. The new home segment has seen a major surge this year and that is good news for builders. Some of these sales may challenge the resale market which is pretty flat in average price this year, although the number of residential units sold is up 5.5% so far this year. Average selling prices are ahead only .9% overall for residential at $396,109. Condo sales on MLS® (which also includes some new construction sales but not all) where up 17.3% in November and are showing a 9.6% increase year-to-date but average prices are again pretty flat with the average price sold at $260,880 virtually unchanged from 2015. The number of new listings this year is down by about 7% overall and current inventories show the number of residential listings down 14.3 % at the end of November and condo listings down 13.3%. Rental listings were also down by 24.5% at month’s end. This has moved us away from some very high listing inventory levels experienced over 2014 and 2015 and keeps us in a much more balanced market. How long does it take a property to sell in Ottawa? Our days-on-market to sell the average property has increased slightly to 55 days for residential properties (up from 50) and 70 days for the average condo (up from 62 days last year). This is a key statistic for those considering a sale to study in detail for their own area, as it is critical in assessing both marketing timelines and listing pricing. A Realtor can provide up to date and detailed information in this regard. The $300,000 to $400,000 price category is the most active/popular range, followed closely by the $200,000-$300,000 price category. Overall, 80% of residential sales in Ottawa are done at lower than $500,000 and 75%+ of condo sales are done at less than $300,000. These types of ratios are important for sellers to consider when listing, as it determines the size of the potential market for their property. We are entering the quieter period for real estate in Ottawa and while sales should continue reasonalbly strong vs previous years, the months of November-February are our 4 slowest months of the year. Sellers will want to carefully review pricing and competitive factors prior to listing their property for sale during this period. Buying new construction may be optimal at this time of year for closings in summer 2017, as those with existing homes to sell, will be able to sell in the busy spring market. First time buyers will have more months to save and also possibly be able to use their 2016 tax year RRSP contribution for their down payment, in addition to getting the 2016 tax break. Ottawa sales and inventory moving nicely in 2016, prices...not so much.. The Ottawa market has been seeing some very positive unit sales increases since April of this year and the excess inventory problem of the last two years has diminished significantly. One Ottawa Real Estate Board recent press release even wondered if we were on the verge of a “sellers” market, something we haven’t seen in many years here. Residential unit sales have increased 6.8% on a year to date basis but average selling prices are only .6% ahead to $396,400. Condos have seen positive sales growth of 7.4% but prices are also flat at an average of $260,218 which is only .1% higher than a year ago. After a couple of years of heavy listing inventory, we have seen some pretty dramatic decreases over the course of 2016, especially the last 6 months. The number of new listings YTD is down 6.9% and at the end of September residential listing inventory is 18.8% lower than last year and condo inventory is 12.5% lower. So this is positive news for those considering a listing or sale in the near future, although competitive pressures will vary with each property and location. Will new mortgage rules impact the market? There are some opinions saying that the recently announced new mortgage rules from the Federal Government in early October will eliminate up to 15 or 20% of first time buyer but this remains to be seen. If this were true it would certainly have a ripple effect on the overall market. New Federal Government Relocation fee structure cuts Realtor rates come Jan 1. Ottawa buyers and sellers were active in November in the fresh optimism generated by the new Federal Government. Unit sales were very positive for the month with residential sales up 9.7% for the month vs November last year and condo unit sales up nicely by 17.1%. On a year-to-date basis residential unit sales are up 6.1% and condo sales are flat at +.7%. Year-to-date average prices for residential sales are up by 1.7% to $392,183 and the average condo price sold this year has dropped by 1.1% to $260,278. How long does it take to sell on average? The average residential property sold this year after a cumulative listing period of 82 days on the market vs 77 days last year. The average condo sold in 102 days compared with 87 days a year ago. Overall listing inventory has pulled back slightly from some record setting levels mid-year. Residential listings are currently15.6% higher than the 5 year average and condos are 31.9% higher. Listing inventory is overweight higher end properties at $500,000 and above, compared to recent sales patterns. Currently listing inventory above $500K is over 20% of all listings while sales above $500K are only about 15% on a year-to-date basis. Realtors continue to generate more rental listings and lease agreements for their clients than ever and rental inventory is up 50% compared to the 5 year average. Whether this reflects more investor owners or simply sellers who were not able to sell at a desired price point, we cannot be sure. The number of listings that don’t sell and expire or are terminated by the sellers remains at historically significant levels. If these sellers have quit the market then this is a good thing as it lessens what has been a supply/demand imbalance in favour of buyers. If however, these properties are just off the market temporarily and will return to active listing status in 2016 this may mean our inventory issues will continue. It is never too early to plan your purchase or sale for 2016, though we escape for several weeks in the New Year, we are always available by email, text or skype/cell to help you meet your objectives. Merry Christmas and best wishes for a successful 2016! Had a written this note a few weeks ago, I might have taken a more bearish approach on our real estate market results for 2015, but a few weeks on a sunny beach have a way of mellowing one’s perspective. In fact, if one compares Ottawa real estate results with the recent performances of the Canadian $ and the equity markets, we had a pretty darn good year in 2015! The truth is, it was a pretty flat year for sales and prices and we were overloaded with listing inventory for much of the year. Buyers generally had the upper hand, particularly on properties priced at $500K and above where there were inventory levels were often very high compared to demand levels. The time to sell the average property increased again during 2015. Realtors helped owners rent out some 3,000 properties this year which must be some kind of record. Greatest sales activity was recorded in the $200-$300K and $300-$400K price levels. It is difficult to say for sure if this represents some pushback on price levels in general or perhaps that more downsizers are looking for more modestly priced accommodation. Builders had a challenging year also and offered some very good incentives and bonuses to buyers, as a result this added to the competitive pressure on resale listings, particularly in the suburban east, west and south where much of the new construction is concentrated. Reports vary but it appears builder results overall were generally pretty flat, also. If you are wondering about the outlook for 2016 and how to prepare for your own housing plans…stay tuned for some thoughts on key trends and risks in 2016 real estate or touch base with us and we would be happy to discuss your specific buying or selling situation. Experienced independent boutique brokerage with lower fees for sellers! Sales for the month were up 3.7% and year to-to-date are 5.9% higher than 2014. Condo sales continue to struggle due to oversupply in both the resale and new construction markets. Though condo unit sales were up slightly over last October, they were still down 9.4% compared to the 5 year average. Year-to-date unit sales are down .5% compared to last year. Prices took a beat of a beating in October and on a year-to-date basis are down 1.9% compared to the first 10 months of 2014 at $258,995. * average selling prices are affected by the price mix of properties sold and in the current market there is more activity in the lower to mid-priced market segments ie $250K-400K which keeps the overall average price in check. For the first time in a long time, we have seen some improvement in the amount of listing inventory surplus on hand. Residential listings are only 19.5% higher than the 5 year average at the end of October and condos are 42.5% higher. New listings in October for residential properties actually were less than during the previous 3 years and 4.6% lower than the 5 year average, so this is potentially a very good sign. We note however that listing cancellations, withdrawls and expiries continue to run at high levels with residential properties 14.4% higher than the 5 year average and condos 55.3% higher. If some of these sellers have moved to the rental market that would be OK as the rental market seems pretty active. If on the other hand these sellers are just waiting to relist at a later date then perhaps there still may be an overbalanced equation on the supply side. Rental Market listing inventory is up 58.7% over the 5 year average but the number of rentals done by Board members is way up also, so this is not a particularly worrisome stat. Both condos and residential properties have taken more time on market to sell this year with residential properties selling in 80 days vs 75 last year and condos taking 101 days to sell vs 86 days last year. Now is a great time to plan for spring and summer 2016, give us a call if you to discuss your plans and get some ideas on what can be done to optimize your buying and selling process. 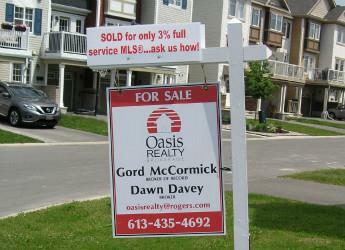 Ottawa listing inventory highest in 12 years! June sales results were generally positive with increases in residential unit sales and average prices but listing inventory continues to grow and make life miserable for many sellers (especially condo sellers). Unit sales and prices for residential properties are up slightly but condo unit sales are down 21% compared to last June and down 15.8% based on a 5 year average for year-to-date sales. Residential sales are up about 4% year-to-date compared to both the 5 year and 10 year averages at the end of June. Prices in both property categories are very modest on a year-to-date basis with the average residential property posting a 1.7% increase to $398,051 and the average condo price sold this year is $263,843 for an increase of .5%. We checked back as far as our available stats permit and our current inventory levels are the most for any month during the last 12 years. Though our demand level is reasonable overall, there are just too many sellers in the marketplace. Residential listings continue to increase and are 34.8% higher than the 5 year average and 39.2% higher than the 10 year average. Condo listing inventory is 57.4% higher than the 5 year average and 100% higher than the 10 year average. On the good news side, many of these sellers will also become buyers if their existing properties sell. Who is having the most trouble selling? There are a number of categories that suffer more than others in this type of buyer’s market, best to check with a Realtor to see how these circumstances might affect a particular property. We’ll have a post on this later this week. Condos, unique properties, non “move-in-ready” properties, higher priced listings, FSBO’s and those with excess improvements head the list of “toughest to sell” listings right now. New construction sales and starts are down slightly on a year to date basis, having recovered somewhat over the summer. Earlier trend suggested builder sales were off as much as 20% but this has improved. Builders are still offering significant incentives for buyers to consider new construction. This adds to the competitive choice for buyers but also makes even more competition for the resale listing, particularly for newer homes in areas where the builder is still building the same or similar models. We expect to see continuing price adjustments by sellers who have now missed the peak spring market which should help keep residential unit sales in positive territory during the summer. Condos may be another matter altogether. Get it sold by September! Save $1,000’s on commissions and get it sold now! Ottawa real estate has had a pretty good summer all things considered, though prices are still pretty flat and we still have some listing inventory concerns, August was a pretty good month with decent unit sales increases for both residential properties and condos. Sellers may have compromised on price expectations, as both residential properties sold were flat and the average condo sold during the month was down 7.3% compared to 2014. Residential unit sales are up 5.3% YTD and the average selling price is up 1.9% to $395,437. Condo unit sales are down slightly by .5% YTD and the average selling price is down by 1% to $260,017. Residential listings continue to run at quite high levels with the number of listings currently reported by the Board being 31.8% higher than the 5 year average. The number of current condo listings is 52% higher than the 5 year average. We can expect to see continued price pressure with these listing inventory levels, particularly in the $500K+ market for residential properties and $300K+ condo market, where we have a fair amount of excess inventory. Are some sellers leaving the market? There may be an indication that some sellers are leaving the market, as the month of August showed a very high level of listing expiries, cancellations and withdrawls. This number in August is 49.7% higher than the 5 year average for residential and 74.9% for condos and might mean some sellers are rethinking their marketing plans or waiting to relist at a later date, perhaps even next spring. Some sellers may also be selling now and renting, as they await a new construction home or simply to ensure they get their existing properties sold prior to purchasing another. Rental transactions involving Realtors are way up this year so many sellers may also be looking to rent their properties if they cannot secure a satisfactory sale. Fall business is steady in September and October but starts to fall off in November, so sellers will want to plan accordingly. With properties generally taking longer to sell in our current market, the best time window for getting a property on the market is now! If you are not working with another Realtor and would like to discuss your plans for a fall, winter or spring/summer 2016 sale, please give us a call. 613-435-4692 It is never too early to plan your housing strategy. May results were pretty positive for unit sales with an overall increase of 7.7% compared to May 2014. June looks to be another fairly strong month also, before we head in to the summer and fall seasons where unit sales typically drop 20-25% in the summer months and 40-50% in the fall. One month of reasonable growth in unit sales does not do much to decrease an inventory level that remains a challenge for many sellers. Overall unit sales and demand has been steady but a price sensitive market with lots of competition has kept average prices in check. Through May, residential sales prices average only 1.1% more than last year and the average condo unit selling price is down 0.7%. We still have an excess of listing inventory and listing flow has continued strong this month also. Overall, we see a total of approx. 10,500 residential and condo listings at time of writing (June 17th) which is enough for the next 10 months anticipated sales. Or put another way: if we did not have another new listing, we have enough listing inventory for expected sales until the middle or end of April next year! The number of residential listings at the end of May was 34.3% higher than the 5 year average between 2010-2014 and condo listings 57% higher. 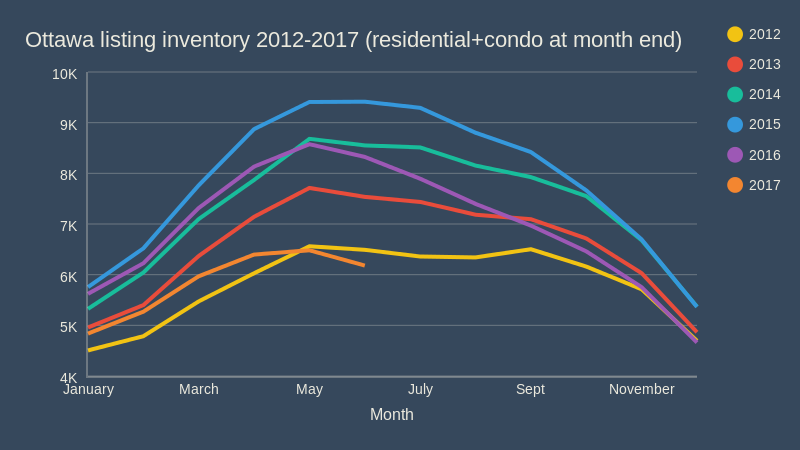 This inventory is weighted heavier in the higher priced listings ( residential $500K+ and condos $300K+) so while there is an overall excess inventory this may not be true for all areas and price points. Speak with your Realtor about the market dynamics in your area of interest. "Second" season slows but still the best time to sell before next spring! As one can see from the table below (When is the best time to sell? ), monthly unit sales start to decline from the end of June and continue to do so until things start to ramp up for next spring. So summer is far from a "dead" time in Ottawa real estate and is the 2nd best time of the year to get a sale done. April sales not bad vs 2014 but flat vs 5 year...inventory still the issue! Sales up vs March 2015 and April 2014…but flat vs 5 year average:As reported by the Ottawa Real Estate Board in the monthly press release http://www1.ottawarealestate.org/home/NewsInformation/LatestNewsRelease.aspx , April results look pretty encouraging at first glance, with unit sales up 10.6% compared to April last year. Overall, however, April unit sales are pretty flat with the 5 year average (2010-2014) Residential unit sales in April were 3.4% higher than the 5 year average and condo sales were off 19.4%. The average price of properties sold in April remains pretty modest with the average residential selling price increasing .9% to $403,239 and the average condo selling price increased 2.7% to $265,371. New residential listings for the month were up 9.1% compared to 2014 and 17.7% higher than the 5 year average. New condo listings were up 8% from a year ago and 25.1% higher than the 5 year average. Residential listing inventory at the end of April was 11.8% higher than last year and 35.8% higher than the 5 year average. Total condo listings at the end of April were 15.7% higher than last year and 65% higher than the 5 year average. Given these inventory conditions, we would still categorize this as a buyer’s market, although the underlying demand seems reasonable and April results are encouraging, we still see a lot more sellers than buyers and that means a very competitive and price sensitive market. New construction sales were reported to be down 20% in the first quarter by PMA Brethour Consulting, so builder competition is fierce and provides further competition for those selling in the resale market. Those buying for the first time and those upgrading with a mid-price property to sell are in an advantageous position as prices have not been going up and they benefit from very competitive pricing in the market. Those downsizing and those selling $500K+ homes will be finding a much more difficult time of it and will want to make sure they are taking appropriate action to get their property sold now. If it doesn't sell now during peak season, it will be even tougher to sell later. A frank and objective discussion with your Realtor about how to get this done, is essential and highly recommended. Unit sales grew seasonally in March (from February), as usual but not enough to melt down a glacier of listing inventory and in fact, it appears the growth of listing inventory continues increasing to unprecedented levels. Current inventory levels are the highest in 10 years (or more!) for this time of the year. With the 2 or 3 biggest listing months ahead of us this does not bode well for many sellers, unless a torrent of demand surfaces which is highly unlikely, based on established trend lines for unit sales. Average prices were totally flat (actually a slight decrease of .1%) for both residential (avg $380,930) and condo’s (avg. $256,725) sold in the first quarter. Residential listing inventory grew 10.1% compared to March 2014 and condo inventory grew 7.4%. The rate of growth of new listings was a factor also, as new listings during March were up 15.6% for residential listings and 20.3% for condos, compared to last year. Total Residential listings at the end of March are 34% higher than the 5 year average and condo listings are 57.9% higher. The number of selling days it takes to negotiate a sale has also increased. Total days on market to sell a residential listing to date in 2015 were 94 days this year vs 75 days last year. The average condo took 107 days vs 97 day during the first quarter. Despite fantastic mortgage rates and a generally good local economy, it is very difficult to envision a really strong spring market in Ottawa real estate. Many sellers in the market will either have to compromise significantly on pricing expectations or abandon the market in order to get supply and demand back in to some kind of balance. Both buyers and sellers will want to stay close to their Realtor and the market to be on top of new listings, sales and other competitive pressures. Though the overall market looks pretty challenging that does not mean that every property is “fire sale priced” and well-priced and presented properties can sell quickly at this busiest time of the year. Buyers and sellers not working closely with a Realtor may miss out, so those not engaged with a Realtor may wish to do so now. If you are not already committed to another real estate professional we would be glad to discuss how you can best meet your buying &/or selling objectives in this challenging market. Is it a flood of sales....or just listings in Ottawa real estate 2015? Is it a 1990's replay in Ottawa real estate? Is it “déjà vu, all over again” in Ottawa Real Estate? short answer: ...let's certainly hope not! We have suffered through another slow year in Ottawa real estate in 2014 with flat sales and overall prices barely in positive territory. A Federal restraint program and a build up of listing inventory have taken us in to a buyer’s market. (supply/demand imbalance favours buyers) Let’s take a quick look back at the last couple of decades and see how our market has evolved over the last 25 years. We started the new millennium strongly for the first 11 years with average prices doubling from $157,511 in 2000 to $327,225 in 2010, an average increase of 9.8% annually. Unprecedented low mortgage rates during this period helped fuel a run up in prices and also helped cover some lost ground from the 1990’s. New Trajectory 2011-2014: Should we have seen this coming? When one looks at average price movement since the end of 2010, it definitely paints a picture of a new trajectory in market results. We have certainly noticed and reported on slowing market conditions which really became apparent mid-2012. Our current excess listing inventory did not happen overnight but has accumulated based on flat unit sales results over the last couple of years. This excess supply (plus new construction inventory from builders) resulted in competitive price pressures and lower average selling price increases. Is it the 1990’s all over again? The 1990’s were a dirty decade for Ottawa real estate. A recession plus a Liberal Federal Government that slashed jobs to balance the budget put a real chill on the Ottawa market for the whole decade. Average prices from 1990 to 1999 grew a total of only 5.8% (from $141,438 to $149,650) for an annual average increase of only .58%. In fact, the average selling price actually decreased in value during 1994, 1995 and 1996, something seen only 5 or 6 times in the history of the Ottawa Real Estate Board. Unit sales dropped by 31% from 1989 to 1995, before getting back to 1989 levels later in the decade. As independent business people on 100% commission, the ranks of the Ottawa Real Estate Board (OREB) are closely aligned with the level of business and activity. As one can see from these simple stats; membership dropped 47.8% between 1989 and 1999. Since 1999, membership has grown approx. 226% to its current level. Growth has already levelled off and could be expected to plateau or even decrease if the current trend lines continue. So how does this affect me and my housing plans? We fully expect to see a continuation of these tougher real estate market conditions for the foreseeable future and this makes it all the more imperative for both buyers and sellers to be aligned with an experienced and qualified real estate professional. If you do not already have a REALTOR® under contract, we would be happy to discuss your specific objectives and strategic alternatives for 2015. Ottawa real estate residential prices showed a 3.2 % decrease in the average price of properties sold in October, compared to Oct 2013. While one month does not make a trend, it is only the 2nd time this year that average selling prices in a month have been lower than the previous year. (the other month was July) Quite likely the weight of listing inventory fuelled the price drop, as many sellers chose to compromise on price to get deals done. This helped push the # of unit sales up slightly for residential homes by 5.6% for the month, although MLS® condo unit sales were down 8.1%. Another statistic that clearly emphasizes the problem is that residential listing inventory is almost exactly double what it was at the end of Oct 2009 when we had a seller’s market (average prices increased 13.3% during that month!) and a comparable level of unit sales. This is almost 3,000 more listings now than then! With the current listing inventory excess, we would expect to see a strongly competitive market, unless sellers quit the market en masse to relist in the spring which is unlikely to happen. Our expectation is that prices will stay flat or in slightly negative territory as sellers compete for available buyers. This should also continue to maintain unit sales levels in positive territory. Underlying demand and activity seems pretty solid and it would only take a few hundred extra sales monthly which would turn those sellers in to buyers and thus push the whole market in to more positive territory. We are hoping that the Federal Government eases budget restraints somewhat in the coming election year and personnel relocations (especially DND) can return to more historical levels. We are happy to discuss your 2015 plans for buying and selling if you are not already working with another real estate professional. It is never too early to plan and prepare for success! Many sellers will have some tough decisions to make this Fall/Winter, as a slower sales trend continues with fierce competition in a very price sensitive market in most areas of the city. There is clearly a significant overage in listing inventory and therefore a supply/demand imbalance in favour of buyers. Many sellers may have to reduce their price expectations, possibly cancel or delay purchasing plans or simply take their properties off the market and reconsider their housing plans altogether. Listing inventory continues to be the dominant statistic to watch and the problem is showing no signs of fading away, in fact if anything it is growing worse. Residential listing inventory is currently running 34.9% higher than the 5 year average at the end of September and condo inventory is running 61.1% higher. There are actually over 1,000 more residential properties for sale right now than there was at the end of March this year when we were just starting the 3 busiest sales months of the year. By contrast, come November 1st we are heading in to the 4 slowest sales months of the year. The number of residential unit sales was up slightly during September over last year and the 5 year average. (3% and 3.3%) On a year to date basis, residential unit sales are up 2% while condos are down 7.9%. The average residential selling price this year is up 1.3% to $387,640 while the average condo selling price is down slightly by .8% to $261,649. This is new statistic being compiled this year by the Board which gives a better picture of how long it takes to sell a property in the current market. The CDOM for a residential property sale this year is 73 days on the market and for a condo it is 86 days. Our continuing heavy listing inventory conditions continue through mid-summer and we believe sellers adjusted their price expectations to get deals done in July. The average price of residential properties sold in July was $377,791 a decrease of .8% compared to July 2013. The average condo sold was $261,663 a decline of 5.3%. The Ottawa Real Estate Board notes in their press release that there appears to be a higher balance of sale (% of total) in lower priced or entry level properties thus skewing the average prices lower. Though this may be true, it is clearly a very price sensitive market and on a year to date basis prices are generally pretty flat overall. Based on the amount of “marked down” listing inventory and the amount of recycled listings, we clearly have a market favouring buyers for the foreseeable future. Listing inventory leaps again in July! By far the most worrisome statistic is the amount of listing inventory. Our July end residential listing inventory is 14.4% higher than 2013 and 41.6% higher than the 5 year average! The condo numbers are even worse with a 14.7% increase in the number of listings compared to last year and 79% higher than the 5 year average. (2009-2013) This translates to 1,000 more properties for sale now than at the end of July last year and almost 3,000 more than the 5 year average. Total inventory also translates to about 9 months of expected sales, even if there are no other new listings, so this will continue to be a tough market for sellers. Residential sales for the year are slightly higher in transactions by 1.7% and the average price of properties sold is 1% higher at $389,078. Condo sales transactions are off by 6.5% and the average price of the resale condo sold has dropped slightly by 1.2% to $262,345. The average residential property has taken 71 days to sell this year and average condo 86 days. *We have a special FREE professional photo offer and a commission rate hold incentive for those thinking of selling in 2015. Depending on your point of view, June sales were either steady or lacklustre with residential properties showing a slight increase in both # of transactions (over a slow June 2013) and average prices increased 1.8% during the month. Condos sales were flat and average prices -2.8% lower than last year. Average prices for residential properties sold this year have eked out a 1.4% increase to $391,374 and the average condo sale registered this year is off -.5% at $262,469. Listing inventory for residential properties at the end of June is 37.2% higher than the 5 year average from 2009-2013. New residential listings during the month were the highest recorded during the month of June during the last 10 years. Condo listings are 79.3% higher than the average over the last 5 years. We believe military moves have both decreased and been delayed this year, due to budget issues at DND. Builders are facing higher development fees with the City of Ottawa 5 year review being completed and 22% to 31% higher fees expected as early as October 1st. ($5,000-$8,000 per house/unit) Builders may have prebuilt inventory to avoid the pending higher fees and are also seeing either flat or declining unit sales, so buyer incentives have been quite strong compared to the recent past. Many sellers are also buyers and if they cannot get their existing home sold or sold at an acceptable price, then they are not in a position to become buyers. Listing price is even more critical in this market which favours buyers and sellers have to remember to stay on top of all resale listing competition and new construction homes in their area. As competitive listings change prices or builders change their offerings, sellers have to be prepared to act accordingly. As houses sell, those still listed need to be in tune with actual selling prices and determine if this impacts the opportunity for their own listing. It looks like the rush of new listings crested in mid June, as the daily # of new listings seems to have retreated this week of June 23rd and is easily 25% to 30% lower than the daily new listing activity only a couple of weeks ago. Sales look pretty steady this week also, although there is little reason to expect a change in the current flat trendlines in both activity and average prices. Though sales drop off in July, August and Sept from highs in April-June, the summer is the 2nd most important selling period of the year. In fact, the number of sales transactions in July typically is not exceeded again until March or April of the following year. If you would like a professional assessment on buying or selling plans in this market environment, please give us a call at 613-435-4692. See chart below which contains the transaction history for the # of residential and condo sales recorded monthly over the last couple of years as reported by the Ottawa Real Estate Board. Well in to August and our real estate market has demonstrated a middling performance at best. Transactions and prices are pretty flat compared to previous years in the resale market and the new home market is also flat but is 17% off the 5 year average. Well that is most of the bad news but who is most affected? 1. those buying new construction with an extending build period, who have little choice but selling in what we are now calling a “buyer’s market”. 2. those who are selling based on previous seller’s market expectations which were mostly the case from 2000-early 2012 when our market started to slow down. 3. those selling who have only been in a home for a short period of time i.e. 3 years or less. 5. those leaving Ottawa for another market may be at a disadvantage, if they are moving to an area where housing is currently stronger such as Toronto, Calgary, Edmonton, and Vancouver. 6. those selling homes that they have extensively renovated and landscaped, as the market typically does not pay back all those costly reno $$, particularly if the homeowner is paying retail for those upgrades. Newer homes with extensive builder upgrades fit this problem category also. We have a lovely home in our neighbourhood that has been on the market for over 400 days for primarily this reason. 7. condo resale sellers have a really tough go right now, given the level of listing inventory (+ 79%) and the amount of new construction. 1. Though the market has been slow it has not dropped dramatically and there is still decent interest by sellers and buyers. Most sellers are also buyers, so as soon as they are able to get their existing properties sold, they will become buyers. 2. those saving for their first home purchase and those looking to upgrade are not seeing prices rise and putting their “dream home” further out of reach. 3. low mortgage rates prevail, allowing buyers to get their dream home at historically reasonable monthly rates. 4. homeowners are paying off vast amounts on their low rate mortgage principal amounts and thus improving their equity position. 5. buyers will have the upper hand in most cases and should be able to negotiate favourable prices and conditions of sale. We may even see a rebirth of the “first refusal” buyer offer. 6. we believe that there is a growing level of rental inventory out there and if so, this should help hold the line on rental price increases somewhat for those still saving for their first home. 7. A slower but stable market is probably good news overall, as it means the likelihood of a steep “correction” is much less. Ottawa is amongst the most stable real estate markets anywhere and still a great place to buy or sell. Sales results were generally steady (or flat, depending your perspective) in May 2014. Residential sales transactions showed a slight increase over the 5 year average by 2.5% while condo sales continued to stagnate with 13.9% fewer sales than the 5 year average. For the first 5 months of the year the number of residential sales transactions is down 1.2% and condos down 9.1% compared to 2013. Average selling prices during the month were steady, a little surprising given the listing inventory level. On a year to date basis, the average residential selling price is up 1.3% to $392,108 and the average condo price is up slightly .2% to $263,687. New listings surged again in May with residential listings recorded that were 25.8% higher than the 5 year average and condo listings were 39.8% higher. While May is typically both the #1 sales month and the #1 month for listing activity, this number of new listings in a flat sales environment is definitely a problem. Residential listing inventory at month end is 36.9% higher than the 5 year average (2009-2013) and the number of condo listings is 75.5% higher. Combined, this means we have almost 3,000 more properties currently listed at this time of year than the average over the 5 year period. Given our late start this spring and the amount of listing inventory; we might expect June to be a fairly strong month for the number of transactions exceeding May as the #1 sales month. There is no question we have a supply/demand imbalance in favour of buyers, so one might expect to see pressure on average prices. With typical unit sales demand falling off 25% in the summer months, June is definitely the best time for sellers to get a deal done. Unless we see an exceptionally and unexpectedly strong June &/or many sellers quit the market, we can expect to see buyers generally have the upper hand for many months to come. Builders will also be offering some very interesting incentives both to generate closings over the winter months and also to beat the anticipated $5,000-$8,000 development charge increase which is being voted on by Ottawa City Council on June 11th. To find the best builder new construction deals, give us a call 613-435-4692-as new home sales and buyer representation is one of our specialities! Note: we pay a 10-20% new home buyer bonus and also offer excellent listing programs for leading builders in our area!. If you would like a no charge no obligation consultation on how these overall market conditions affect your own buying or selling plans, please do not hesitate to give us a call.